Three fire tenders were pressed to control the blaze that caused extensive damage to the principal's office and the adjacent record room situated in the hospital premises. No loss of life has been reported in the blaze in Gorakhpur's BRD medical college. 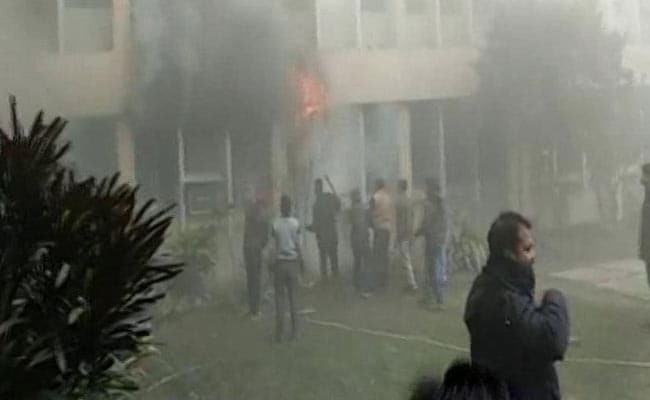 Gorakhpur: A major fire today gutted the principal's office and an adjacent record room of the state-run BRD Hospital in Gorakhpur, the fire department said. No loss of life has been reported in the blaze in the hospital, which was in the news last year after scores of infants died at the facility. "Prima facie, it seems that the fire was caused by a short circuit," SP (North) Ganesh Saha said. A committee has been constituted to probe the reasons behind the fire, Chief Fire Service Officer T K Singh said. Six fire tenders took nearly an hour to control the flames which destroyed important documents in the record room. The Baba Raghav Das Medical College had hit the headlines in August last year when 63 children, including infants, died within a span of four days when the supply of oxygen was allegedly disrupted due to non-payment of dues to the vendor. The state government has, however, vehemently denied that shortage of oxygen led to the deaths. An FIR against nine accused, including ex-principal Dr Rajiv Misra, his wife Dr Purnima Shukla and nodal officer Dr Kafeel Khan, was filed by director general medical education (DGME), K K Gupta in Hazratganj police station in Lucknow and police have filed a charge sheet against them. All the nine accused have been arrested.